… consider that I am finally here. On the verge of my book being published. And also here right now on the couch in my living room at some ungodly hour. The animals are very loyal. When I wake up in the middle of the night and come into the living room to write and read until I can fall back asleep again, they accompany me, all four of us silently creeping out of the bedroom where Oliver is sleep-muttering in wonderment at a very private dream-thing. Kismet the kitten, finding her lapspot taken by the laptop, curls herself along my leg. Milo is a sprawl of white fluffy dogginess against the side of the couch. Arigato in his feline wisdom poses thoughtfully by the heater. They sleep. So there are the small immediate things: the two cats and the dog and Oliver, all comforting to me in their solid sleeps. There is me awake and typing this. And there is my book coming out in a few days. OK, my agent didn’t make me do anything. Yet as the publishing world changes, agents are increasingly taking on some of the role that used to belong solely to editors. Many agents now provide editing advice for clients before submitting the book for publication. When I first met my agent, Katherine Cowles, she said, “I love your book, I can sell your book. No problem.” Of course, that was music to my ears, having slaved over it in obscurity for many many years. I was ecstatic, actually. She was the first agent I’d approached, and she was certain she could place my book at a top publishing house! In my delirium, I scarcely noticed when at the very end of our first meeting, she added kind of casually, “I’m thinking, though, that you need to cut down a few sections. I’ll send you my ideas for that in an email.” I nodded gamely: sure, I could trim a few sections, no problem. I decided to trust her. She knew the business after all – I knew nothing about it. And now that she’d pointed it out, I could see how potential publishers might be daunted by a 600 page manuscript from a completely unknown writer – a manuscript so huge it had to be bound into two volumes. I jumped in and worked incredibly fast. I didn’t do the cuts exactly as my agent specified – and she was fine with that – but I did cut about 120 pages, working night and day. There are tons of continuity problems that crop up when you start making cuts on that scale. You have to find every single place that material might have been referred to later in the book. It’s a nightmare. I was in tears by the end of the first day of editing, not just because of all the continuity problems I was facing, but also because it was heartbreaking to lose some of my favorite parts of the book. “She might as well have asked me to cut off my arm!” I wailed to my boyfriend. But interestingly enough, almost all the material she had picked for the cutting room floor was very old, from when the novel had a different narrator and point of view, material that I was so loathe to lose that I’d tried to force it into the book’s new structure. It didn’t really work – and being a sharp reader, she’d picked up on that. It was extremely painful at first. I started calling my new manuscript “The Tricking of Freya Lite.” But true to her word, in a very short time my agent had me signing a contract with a major publisher. By the time I was at the editorial stage with my editor, I didn’t even mention to him the idea of reincorporating the 120 pages from the cutting room floor. I could see that the book was probably… I hesitate to say “stronger without it,” even now. I still love that lost material. But the book is definitely a better read. It was a smart decision on my agent’s part. And true to her word, she never made any further editorial suggestions for my book. She left that to me and my actual editor. I’m secretly considering using some of that lost material in my next novel – but knowing my agent, she’ll probably want to cut it out of that book too. I don’t elaborate there about what “everything” actually consists of. But here I’ve got a little more room. Oliver and I met six years ago on a flight from Seattle to San Francisco: love at first sight, I kid you not. The first year was pretty uneventful, in terms of Big Life Events, which is good, in retrospect. The calm before the storm. In the next five years, Oliver would see me through some of the biggest events of my life: the death of my mother, shoulder surgery, finishing my book, changing careers, finding an agent and a publisher, autoimmune disease, cancer, my father’s death, and getting ready for the long awaited launch of my novel. And he’s still here, claiming to still love me, after all of that. His quick wit, endlessly clever mind, and split-second word play. His deep-set blue-gray eyes. His fanatical (maniacal?) passion for golf. The way he fed his cat by hand for two weeks when it had a broken jaw. How he can perfectly mimic any animal sound (though he’s still perfecting his elephant seal imitation). How when he plays guitar and sings I don’t think about anything, I just feel the song-glow. How he still sends people letters and cards through the mail, even on non-special occasions. That he collects mushrooms on hikes and then looks them up in the mushroom book when we get home, just like my dad did. His seemingly infinite knowledge of historical facts. His passion for the underdog. His stubborn commitment to auto-didacticism. How being with him is the best part of my day, every day. I hesitate to title this post “Learning Icelandic” because it might leave you with the impression that I have, actually, learned Icelandic. As in mastering it. Which I have not. But in another sense “Learning Icelandic” is a perfect phrase to describe my experience, because it implies a continuous present, as if I were always in the process of trying to learn Icelandic. Which I am. There are no Icelandic language classes in California, or almost anywhere else in the U.S. So my quest to learn Icelandic here has been a varied one, from memorizing lines from the Viking film Hrafninn flýgur (“I’ll cut you into pieces for Odin’s crows!”) to driving an hour and a half every Sunday for lessons with an elderly Icelandic woman who spoke in a whisper. I own Stefán Einarsson’s exhaustive 500- page tome of Icelandic grammar, written for American soldiers stationed in Iceland during World War II, along with a collection of contemporary instruction books. I even enrolled in a month-long intensive language program at the University of Iceland in Reykjavik. And I’m still not remotely fluent. Unless I can find a way to live in Iceland for a couple of years, my chances of mastering Icelandic are remote. Yet I love this beautiful language way too much to give up. These days I’m avoiding the pesky grammar altogether. 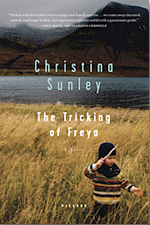 I read novels that are far above my head and listen to radio live from Reykjavik. I can’t understand most of it, but I try not let that interfere with my enjoyment. My book arrived in the mail today! The package felt oddly light, for all those years of work. Oliver took out the camera to document the moment. But just as I tore open the packaging, the camera battery failed. I kept opening anyway. And there it was: my first novel, with its beautiful cover of a woman improbably floating in a lake of icebergs. The first thing I did was to check the dedication page, to make sure the dedication was still there, exactly as I’d written it, and it was. Oliver and I passed the book back and forth, exclaiming about this and that. I acted excited, I jumped up and down and hugged Oliver and showed the book to the dog, who sniffed it but did not seem impressed. But I wasn’t sure how excited I actually was. I wasn’t sure what I felt. I felt too busy to take the time to feel anything: it was still the middle of my work day. Later on, I lay on the couch alone in the house during a rainstorm. The book was on the coffee table next to me, amidst a pile of other books and magazines. Out of the corner of my eye I found myself checking to make sure my name was spelled correctly on the cover. It was. Then I picked it up and began leafing through it. I came across a sentence that stunned me. I wrote that? Why on earth would I have written that? I flipped around until I came to one of my favorite sections, and started reading it out loud. That felt good. Then I closed the book and stared out at the rain. That’s when the flood of feelings came. First, sadness. Why? At first I couldn’t place it. Then it came more sharply, a sense of longing for all my characters, for Freya and Birdie and Anna and Sigga and Stefan and Saemundur and Ulfur and even meddlesome Halldora. My People. Then relief: I was really, finally finished. It was done. I didn’t have to do any more work on it, ever again. No more writing or rewriting or editing or proofreading. Then, finally, came a real and deep pleasure: the thing I had created was here in the world, at last, in its final, physical form. I lay there for a long time, listening to the rain and feeling this strong, quiet thrill. Happy Day! We went out to dinner to celebrate, and of course we brought the book with us, even though it was raining. We had a drink at the bar and I set the book down on the counter in front of me. Just a book, after all, out in the world for its first drink. Floating in a boat on a glacial lagoon – the same lagoon with its dramatic icebergs that years later is now featured on the cover of my book. Watching a sheep with spiraling horns climb on the ruins of the turf-roofed farmhouse where my grandfather had been born in another century. Sampling hákarl, an Icelandic delicacy consisting of fermented shark meat. Enough said. Meeting my distant cousins in Reykjavik, who, despite the fact that they’d never even heard of me before, invited me to luscious salmon feasts in their homes and took me touring around the countryside. Riding a snowmobile over Vatnajökull, Euorope’s largest glacier, and trying not to panic when it broke down in the midst of the vast icy wilderness. Listening to a farmer recite from memory the poetry of my great-great uncle Páll Ólafsson while he milked cows in the barn at dusk. Trekking a still-steaming lava field in the north, where astonishing ribbons of lava seemed frozen in midstream, gleaming with the colors of undiscovered planets. Driving for hours by myself in a rented jeep and never seeing a single car or house or road sign along the way. And, of course, writing down absolutely everything I saw, smelled, heard or imagined in my notebook. Am I my book? Are we the things we make? Of course I’m not, of course we’re not. Just try telling that to my psyche. Yesterday I read some early customer reviews of my novel on Amazon. There are four of them, and they are overwhelmingly positive. One of them, however, mentioned what the reviewer considered to be a few flaws of my novel. As I read, each flaw he identified stung me deeply. Briefly, but deeply. Especially because I happen to agree with him on all counts. Then it occurred to me for the first time: how will I respond if I get a really really bad review? One of those scathing ones? It could happen. I felt a terrible soul-piercing dread. I am not my book, I said to myself sternly. I am not my book. I tried to imagine separating myself from my book, as if it were now just an object in the world (which it is) rather than an externalized element of my being (which it also is). It’s true, clearly, that I am not my book. Yet it’s just as clear to me that my book is of me, that despite being fiction it contains essential parts of my self. Pretending otherwise won’t help me weather criticism. So I tried reminding myself that any review is only one person’s opinion, and opinions don’t matter. Wait. Of course opinions matter. Why would I publish my novel if I didn’t want people to read it, think about it, form their own opinions about it? So now I am trying a different tack: to remember that all things of this world contain some flaw. I may or may not agree with the perceived flaws readers will inevitably find in my book. But find them they will: we humans are a flaw-finding animal. As well as beauty-seeking, beauty-perceiving creatures. And that is a thought that brings me peace. Is this a bad time for first novels? It has not escaped my notice that my first novel is about to be released into the worst economy since the Great Depression. Book sales are down, large publishing houses are slashing jobs, bookstores (chains and independents) around the country are closing. Some of this has to do with larger trends within the publishing industry itself, yet there is no doubt that retail has fallen sharply across the board. Based on current trends, many pundits are predicting 2009 could be the worst year for bookselling ever. As an unknown, unhyped author whose first novel is about to be launched into this economic freefall, I could be pretty worried. Panicked even. But I’m not. When it comes to the economy, I’m really not worrying about my future book sales. What I worry about are the people who are losing their jobs and their houses and their health insurance. I work full time for a social service agency, and our food lines are getting longer and longer each month as the recession worsens. I’m worried about the growing number of kids going to school hungry. Some friends have kindly suggested to me that maybe people will buy more fiction during this recession, as a means of escape. I do believe in the power of storytelling, that stories are a form of human sustenance that will always endure, albeit in ever changing forms. My grandfather was born in a turf-roofed farmhouse in Iceland, where people often struggled for enough to eat, yet they never stopped telling stories and reciting poems through the long hard winters. So I hope some readers, however many, find sustenance in my book. And even more, I hope that we’ll be able to rebuild our economy and get food into the stomachs of hungry school kids.